The R-7 « Semyorka » (small seven) might be one of the most iconic rockets of all time, scoring above a staggering 1600 launches over five decades. It sent Sputnik, the first manmade satellite, into space in 1957 and made mankind a spacefaring race only a few years later. It has since launched payloads for all ranges of space applications. While you might think that this venerable rocket is outdated, it is still the workhorse of the Russian space industry, and the only means of access for astronauts to the International Space Station. Meet the latest arrival in this long series: the Soyuz 2-1v which made its maiden flight last December 29th, as a late Christmas present. A few years and a few changes to the rocket and launch pad later, it was time for Yuri Gagarin to start his journey from Launch Site No. 1 and make history aboard another R-7 derivative. Since that day, all cosmonauts and astronauts departing from Kazakhstan have launched onboard one of the many descendants of this rocket. The R-7 series has become one of the most reliable and most versatile launcher family in the world, almost a fourth of all satellites sent into space worldwide have been launched by an R-7 derivative. The latest family from the R-7 dynasty is the well-known “Soyuz” launcher which is named after the Soyuz spacecraft used by the Russians for manned spaceflight. Several configurations of this launcher exist, one of which is even launched from the tropics by Arianespace as a commercial launcher. But the latest addition to the Soyuz family is the quite secretive Soyuz 2-1v launcher, which made its maiden flight last December. An example of mating of the core stage and strap-on boosters of the Soyuz rocket in Kourou, French Guiana. These boosters are jettisoned prior to the main stage engine cut off during flight but provide most of the thrust at lift-off. (Credits : Arianespace/CNES). Soyuz, and more generally all R-7 rockets, use exclusively rocket engines burning liquid propellants. The common architecture to all variants of the R-7 rocket is a core booster stage surrounded by strap-on boosters. On top of this core stage there is another smaller liquid stage separated by an open truss structure. This design is quite uncommon in the launcher industry but is a simple solution to two problems of the early days that remain two of the main challenges of space flight today: igniting an engine in space and separating the stages. The central stage and the strap-on booster engines of a Soyuz rocket are all ignited on the ground. The smooth operation of the engines is tested during thrust ramp up while the rocket is still attached to the launch pad. The launcher is then released only after startup of all engines is confirmed. At this point, most of the thrust is provided by the strap-on boosters. After leaving the lower layers of the atmosphere, less thrust is needed to keep the launcher in flight and the strap-on boosters are jettisoned with the core stage still in operation. This avoids the complex process of shutting down the lower stage engines properly before releasing the second stage and igniting its engine. This separation is a complex transient phase as you must do it quickly: every second lost at this point can be a net loss in the overall performance. You must also make sure that the bottom stage does not have any residual thrust, for it might collide with the second stage after separation. Last but not least, you must make sure that the nozzle of your second stage does not hit the bottom stage upper skirt. With a so called ‘parallel’ architecture, meaning that the stages are next to each other instead of staged on top of one another, most of these problems are avoided. 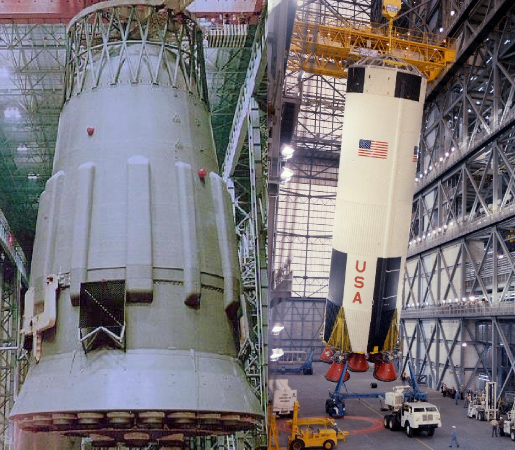 An example of two massive first stages: the Russian N1 Block-A (left) and the American Saturn V S1-C (right). Note the truss architecture at the top of the stage for the Russian launcher and the skirt architecture on the American launcher (Credits: NPO Energomash, NASA). The third stage architecture of a Soyuz rocket also helps greatly to prevent any of these problems from happening. It uses a truss architecture, meaning that the two stages are linked by a set of metallic beams. This allows for exhaust gases coming from the engines of the upper stage to flow out without a problem, even if the stages are not separated. The usual interstage architecture used in the west is a skirt, a massive metallic cylinder going from one stage to another. While it does not allow exhaust gases of the upper stage to pass, it is a far more efficient frame to avoid turbulence while going through the atmosphere. The Soyuz 2-1 variants (including the Soyuz 2-1v) are bound to replace the Soyuz U in the coming years as the workhorse of the Russian Space Forces. 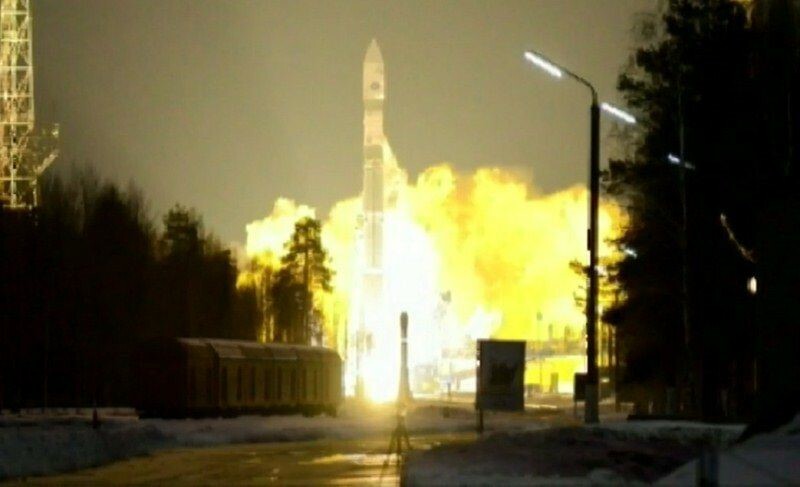 It launches from the Plesetsk Cosmodrome in Russia and might become available for launches from Baikonur in Kazakhstan once it is declared fully operational. The Soyuz 2-1v is scheduled to replace the Rockot launcher as a small class launcher for the Russian Space Forces. The Rockot launcher, a modified soviet Intercontinental Ballistic Missile (ICBM for short), will be retired as soon as the stockpile of ICBMs runs out, which is expected in the next decade (approximately 120 of these ICBMS are still operational in the Russian Strategic Forces). In many ways this evolution is quite a revolution in the Soyuz family as it abandons the strap-on booster architecture used on the R-7 since its birth. This modification requires replacing the standard Soyuz core stage engine RD-118, which does not have enough thrust to lift the rocket at launch, with another more powerful engine. The choice made was to use the NK-33 engine as a replacement for the main thrust chamber and to keep an RD-0110R Vernier engine (a small four-chamber auxiliary steering engine) for maneuvering. The NK-33 features a staged combustion cycle and uses liquid oxygen and a Russian equivalent of the RP-1 kerozene as propellant. The staged combustion cycle is a rocket engine architecture where a turbopump elevates the pressure of the fuel and oxidizer coming from the tank. The turbine driving the turbopump is fed by a gas generator burning part of the fuel and oxidizer coming from the tanks. The exhaust gases leaving the turbine are reintroduced into the main combustion chamber where the combustion is completed (hence the term ‘staged combustion’). 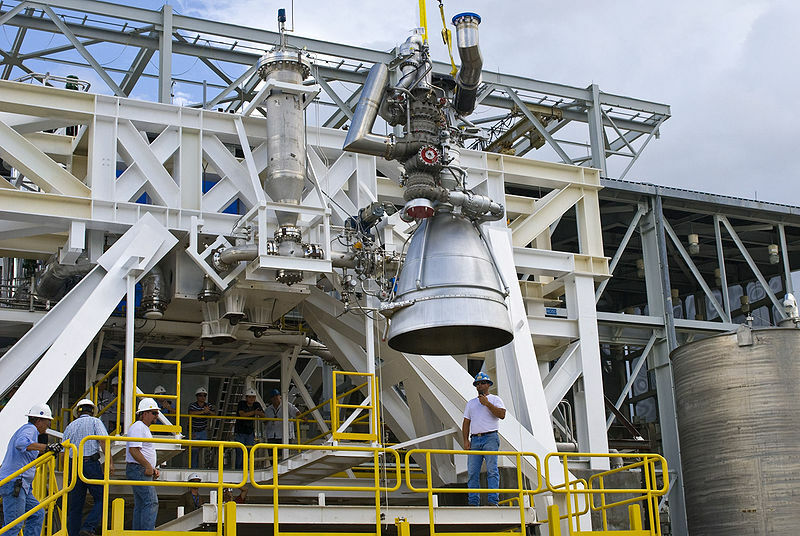 The first stage testing started in the summer of 2012, a half-year after the first test stage was built. After a second test in March 2013, the first stage was declared ready for flight. 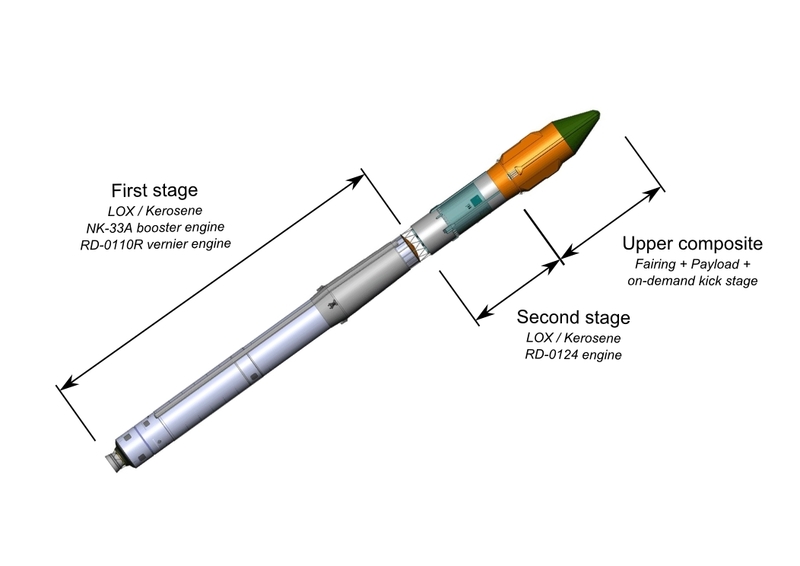 The second stage of the Soyuz 2-1v launcher is propelled by the RD-0124, a powerful variant of the RD-0110 engine featuring a staged combustion cycle, like the NK33. This engine has been in operation on the Soyuz 2-1b since 2006 and therefore has a proven flight record. In addition to these two stages, a Volga upper stage can be fitted under the shroud to give an extra boost to the payload, improving the accuracy of the payload injection orbit at the cost of some performance and providing restart capability to achieve sun-synchronous orbits that are used for imaging satellites, whether civil or military. The LC-43 launch pad of Plesetsk had to go under extensive modification to prepare for the Soyuz 2-1v launch. The launch pad, previously designed for the older versions of the Soyuz, could not hold a Soyuz launcher without strap-on boosters. The first launch, planned initially for September 2013, was pushed back to December after a series of small mishaps. The first launch of the launcher (including a Volga upper stage) took place on December 29th and successfully put into orbit the Aist-1 satellite and a few experimental payloads. A few of the payload delivery capabilities of the Soyuz 2-1v are given below. The first stage of the Soyuz 2-1v rocket is composed of two separate tanks. The liquid oxygen tank is situated above the fuel tank and is made of an aluminum alloy commonly used in the space industry. The upper part of the stage features the launch pad attachment system. It is used to provide a sustainable attachment point for the four arms of the launch pad keeping the launcher in an upright position once the main umbilical tower has been retracted. The AJ-26 Aerojet equivalent of the NK-33 is prepared to be installed in the E-1 Test Stand at Stennis Space Center (Credits: NASA). The tanks are made of separate shells welded together and are independent. The pressurization system of the first stage is composed of bottles of gaseous helium submerged in the liquid oxygen tank. The helium, kept at a temperature of around 9 Kelvins, is far denser and therefore less volume is required to store it compared to bottles left in contact with the atmosphere. The usual system used on Soyuz to control pressurization uses nitrogen which is far cheaper, but less effective than helium. The NK-33 engine used to propel the stage can be throttled from 56% to 108% of its nominal thrust. Its specific impulse in the vacuum of space is 315s thanks to its staged combustion cycle. It weighs 1.3 tons and provides a nominal thrust of 1500 kN (or 150 tons) on the ground and around 1600 kN in space. The NK-33 is a venerable engine that was used on the soviet N-1 moon rocket under the name NK-15 and is used in an Aerojet-refurbished version on the Orbital Sciences Antares launcher first stage. After the failure of the soviet moon program, the remaining NK-15s were stored in a secure location and are currently refurbished by its manufacturer, the Kuznetsov Design Bureau. The first stage of the N1 rocket used 30 NK-15 engines while its second stage used 8 NK-15 a grand total of 38 engines per launcher. While the N1 failed spectacularly, it was mostly because the piping and guidance systems were flawed by design with such a large number of engines to run simultaneously. The conclusions of the four launches of N1 were four explosions, one of them even destroying the launch pad. But out of the hundreds of NK-15 engines built, 150 survived in storage, 36 of which have been sold to the American rocket engine manufacturer Aerojet General. The most impressive piece of engineering in the NK-33 engine is its oxygen-cooled preburner. It is unusual to use oxygen as a cooling liquid as it tends to combust whenever it comes in contact with a small amount of energy. To work properly, the engine requires sub cooled oxygen, below -187°C or 86K (Antares uses oxygen cooled to 78K). The stage separation system uses pyrotechnic bolts that explode on command and cut the truss structure on top of the first stage. The second stage is ignited while the first stage is still in operation, a common design of all Soyuz launchers. The Soyuz 2-1v second stage is identical to the one in the Soyuz 2-1b launcher. It also uses liquid oxygen and kerosene as propellant with a conventional design of two separate tanks with the fuel tank on top of the oxygen tank. They both use individual bulkheads that are assembled together to form the stage. Within the intermediate bay lies the brand new digital electronics of the Soyuz that was modernized from analog at the turn of the century. The avionics are composed of a standard package of digital computers, 3-axis inertial measurement units that give the rotational and longitudinal accelerations of the launcher, and transmitters that beam down the telemetry. The RD-0124 engine of the second stage is a closed-cycle staged combustion engine with one single power pack delivering the high pressure propellant to four individual chambers. The main turbopump of the RD-0124 turns at a staggering 39,000 rpm, which is a very high rotation speed for a Lox/kerosene engine. This very demanding speed was needed to keep the turbopump small enough to fit in the engine assembly. On the RD-0124, like on the NK-33, the engine uses an oxygen-rich gas generator to drive its turbine. The engine chamber and nozzle are cooled through a regenerative circuit of kerosene flowing though the walls of the nozzles and chambers. One of the great challenges of using kerosene as a propellant and as a cooling liquid is that the kerosene molecules can be damaged by high temperatures before they even reach the main chamber, changing their combustion properties and even changing the viscosity of the fluid. As for the first stage, helium is used for pressurization of the second stage’s tanks. The helium bottles used to store the gas are within the oxygen tank. To insure control of the stage, each of the four nozzles can be gimbaled independently in one direction. The stage functions for about five minutes before the upper part separation. 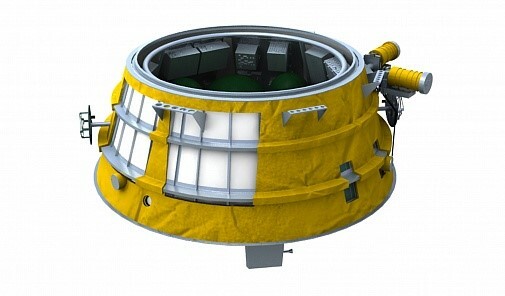 The Soyuz 2-1v conventional architecture puts the payload directly on top of its second stage for all missions that do not require additional performance or an engine restart. To achieve sun synchronous orbit however, an engine restart is needed after a ballistic phase on the initial trajectory. Sun synchronous orbits are a very special type of orbits on which the satellite is actually going against the rotation of the Earth. In an Earth-centered referential, the orbital plane of the satellite is moving a few degrees every orbit, keeping its alignment to the sun. The satellite therefore passes over each latitude at the exact same solar time, and with the same solar exposure each day, which is ideal for surveillance or remote sensing satellites. The Volga upper-stage of the Soyuz 2-1v (Credits : TsSKB Progress). To achieve helio-synchronicity an engine restart is needed, and provided, for the Soyuz 2-1v by an additional Volga upper-stage. It comes right under the payload under the shroud, as if it was part of the satellite from a launcher standpoint. The Volga upper stage was first used as the Ikar upper stage that was the propulsion module of Yantar-class satellites starting in the late 1990s. This program, still under way, aims at reducing some of the remote sensing gap between the Russian military forces and its western counterparts. The Volga upper stage uses a very robust design with most of its components coming from other flight proven systems. Its mission is typically about two hours long but the Volga upper stage is designed for a 24-hour mission time. It is a restartable upper stage of about 900 kg that can be filled with 300 to 900 kg of UDMH (Unsymmetrical Dimethylhydrazine) and N2O4 (Nitrogen Tetroxide) as propellant. These two very common propellants are still very popular in the Russian space industry but tend to be replaced in western countries as they are highly toxic. The Soyuz 2-1v inaugural launch (Credits : Roscosmos). Besides their toxicity, UDMH and N2O4 have two very interesting features that explain why they are commonly used in the industry: they are hypergolic, meaning that they combust spontaneously if coming into contact. For rocket engineers (and everyone knows that engineers are lazy*), it is the dream propellant: no complex startup and ignition system to design. They are also stable under normal conditions of temperature and pressure, unlike liquid oxygen and hydrogen that require cooling to extremely low temperatures. The Volga upper stage has an independent guidance, navigation and control unit and does not require any assistance from the lower part of the launcher or from the ground. The Russian space industry is in a very critical moment of its history. The USSR used to be one of the most prolific places in the world in terms of number of launcher designs in operation. With the end of the Cold War, such diversity is now viewed as an unnecessary redundancy and a reduction in the number of launchers is the center piece of Russia industrial strategy. The Angara program, still struggling to enter its operational phase, was to give Russia a very versatile launcher capable of a wide range of missions that would in fact put into retirement all the other launchers. But as this program takes time to enter its operational phase, the old rockets still have to do the job. The Soyuz is a success story in every way, and any rocket engineer can be seduced by the elegant and simple design of this Ford T of the space industry. Mr. Korolev gave the USSR and its successor Russia a child that would survive longer than any other launcher and put into orbit a quarter of all satellites in its first half-century. For almost 50 years, the basic design of the Soyuz rocket has not changed a lot. After all, why change something that works perfectly? But in the last fifteen years, the rocket industry in Russia has seen a lot of change, a bit like its counterpart in the West. First came the end of the monumental Cold War programs that were pumping hundreds of billions into the industry. Then came the disarmament, leaving hundreds of ICBMs ready for launch, but without anything to launch. The basic clients for such launchers are governments and remote sensing satellite operators along with nanosats and microsats. The very cheap launchers that have come out of ICBM fleets are now reaching the end of their stockpiles as old ICBMs run out. Some see this trend as an opportunity to offer cost effective replacement vehicles. Such vehicles are higher in number every year. Falcon 1 of Space X came too early in a market saturated with old ICBMs, most of the commercial clients for these small payloads went to Rockot, Dnepr, and Volga in Europe and Russia and to Minotaur or Taurus in the US, all derivatives from old ICBMs. Orbital Sciences is now giving it a shot with Antares, Lockheed Martin with Athena II, and Arianespace with Vega. With Soyuz, Russia is joining the race (or more exactly staying in it). But most importantly, Soyuz 2-1v gives Russia independent access to 2 ton helio-synchronous launches and a very strategic launch segment. Mr. Korolev must be rightly proud. *And have a good sense of humor. Feature image caption: The R-7 rocket on the launch pad. (Credits: TsSKB Progress).